I sewed my first thing! 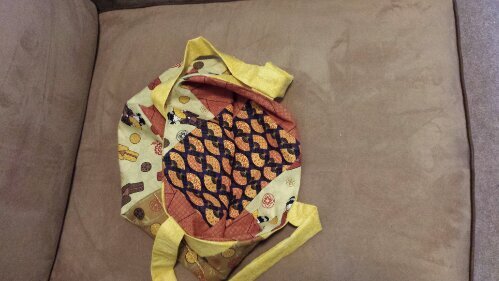 I sewed a small bag for my boyfriend’s aunt who hosted us for a long weekend and took us adventuring in Juneau. The design was never written down or printed by my sewing instructor (the class came free with the purchase of my machine). I love how it turned out. My boyfriend picked the fabric out (made with just a fat quarter). 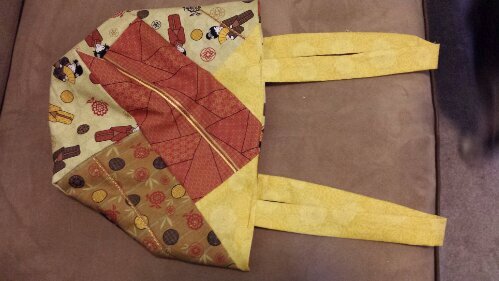 This is a weirdly-folded view to show the different fabrics I used for the lining. The class instructor convinced me to buy a special foot for my sewing machine that creates a nice look using three strands of round cords. I was really happy with how they turned out. On my other projects, the material bunched up quite a lot, so these results are better than usual. I don’t want you to go out and buy an expensive novelty foot that leave you disappointed most of the time. This is another view with the corners tucked in. It makes a nice square shape. I wish I had taken a photo with the bag filled. This photo also shows the embellishment created with a second novelty foot my class instructor convinced me to purchase (I have a back bone, but who can argue with these results?!). This foot uses embroidery floss, and if you are in the mood for a special sewing machine foot, I would recommend this one over the other I used for the cords. The one I recommend is the 7-hole cording foot, and I suggest using embroidery thread instead of the thicker cording. It takes a lot of patience to get the thick cording onto the fabric without excessive bunching. The embroidery thread was effortless! The feet keep the cords neatly sorted for you, so all you have to do is make sure that you don’t have any knots in your cord/thread. 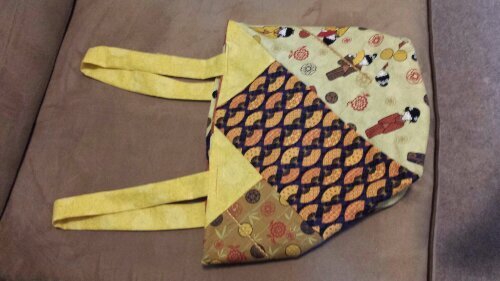 This entry was posted in All, Sewing and tagged embellishments, purse, sewing a purse, sewing machine, Sewing projects. Bookmark the permalink.